Freeman A. Caswell, one of the few surviving veterans of the Civil War, died Tuesday evening at the home of his daughter, Mrs. Arthur E. Nelson at LeSueur, Mn. Because of his advanced age, 93 years, he had been in failing health for some weeks. Mr. Caswell was Commander of the Minnesota Department of the GAR at the time of his death. He served in the Civil War with the Green Mountain Boys of Co. E, Ninth Regiment. He was a member of the George N. Morgan Post of the GAR, of Minneapolis. Some time after the war he became a resident of Sauk Centre and following his marriage the family lived for many years in Manannah villiage. Leaving Meeker County, Mr. & Mrs. Caswell resided in Minneapolis, where she died about two years ago. Following her death he lived with his daughter, Mrs. Nelson at LeSueur. Funeral services were held Thursday afternoon at Sunset Memorial Park, Minneapolis. Excerpt taken from the obituary of F. A. Caswell, in the LeSueur Paper July 1937. "The year 1861 is not likely to be forgotten by any American citizen. It will certainly be remembered by those who lived at that time. On April 12th of that year was fired the first shot of the Civil War. On that day began the bombardment of Fort Sumpter and the next day Major Anderson surrendered. The war so long dreaded, had at last begun. Five days later President Lincoln issued a call for 75,000 men. At once regiments of volunteers were on their way to Washington in response to that call. Only an old soldier can correctly describe the spirit of that day. 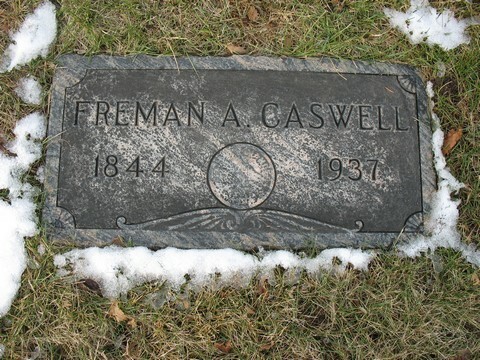 Freeman Caswell was one of those who volunteered but he was then only a boy of 17 years and his father forbade his enlistment. He had to wait until the next year when, being 18, he would not need his father's consent. He enlisted in the army June 11, 1862 and served until June 13, 1865. He belonged to the Ninth Vermont Regiment of the Army of James under General Grant. "This soldier had many badges of honor. He participated in 10 of the battles of the Civil War. Some of these were Harper's Ferry, Fair Oaks, Seven Pines, Fort Harrison and Newport and Winchester,N. C. He participated in the final seige of Richmond and he with his regiment were left there to guard the city after its surrender. He had some thrilling experiences in some of these battles. When the battle of the Seven Pines was almost finished, his regiment was ordered to cross a creek over a corduroy bridge. This brought the soldiers into the clear view of the enemy who opened fire and 12 men were killed on that bridge. He was not more than five or six feet from a man when this man was struck by a shell and killed. The same shell bounded and a few feet farther killed the brother of the first one hit. He (Mr Caswell) was interested in the doings of the GAR He was the Commander of the George Morgan Post No. 4 of the GAR of Minneapolis. The day before his birthday he presided at the meeting of his Post in Minneapolis, and the day before that was also at a party given in his honor in the same city. Last summer he attended the encampment of the GAR in Washington, D. C. (probable 1936). It was a great trip. He and John McConnell, also of Le Sueur, were the only two of the county to attend. He was the last surviving GAR member of Meeker County. " Military Record: CASWELL, FREEMAN A., credited to Sutton; enlisted 6/11/1862, mustered in 7/9/1862 as a Private in Co. E, Ninth Vermont Infantry; mustered out 6/13/1865. Gailene says: "I am a Caswell descendent, but do not know if Freeman is related, but I am sure some of his descendents, or Vermonters would like to read this."